Checking the Profile is easy. We do our best to provide clear photographed images of every key we sell on our website. Once you have found a key that appears to be the same as your key online, you can make a more accurate comparison by printing out exact size line drawings and profiles. These line drawings and profiles can be accessed by following the steps below. Take care to record the product name and part number. This is found at the top of the product page, located above the key blank image. Don't be surprised if your key is listed under a different manufacturer than you expected. Keys often have many uses and applications. For example, someone looking for an Acura key may find it listed under Honda. 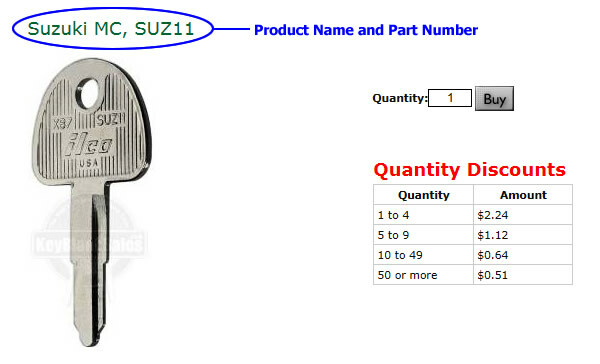 Keeping the product name and part number in mind, you will open the appropriate link at the bottom of this page. When you open your link, scroll through the manufacturer headings alphabetically to find your product name and then the specific key blank part number. Once you find your key in pdf format, PRINT the page. Do NOT skip this step. Many people avoid this step and try to do it by matching the images to the one on their monitor. It will NOT work. Printing Tip. Once you find the key you wish to print, change your printing options from ALL to CURRENT. Lay your key over the image and check the length and width of your key with the one shown. Head styles may vary. In this case, you will be checking from the shoulder or tip of your key up to where the head starts. If the length, width, and thickness of the key matches the key on the page you printed, the style of the head doesn't matter. If your key uses a shoulder, make sure to measure from the shoulder to the tip to ensure this measurement is correct. 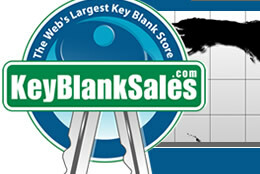 Most keys in our online store can be found in the manufacturers catalog. Originals and keys that came out after file publication are currently not included. Place the tip of your key ONTO the profile of the page you printed as if you are trying to insert your key into the paper, as shown above. Do NOT check the profile by pointing the key towards your eye. This is a common mistake which will cause you to order blanks that are opposite of what you need. 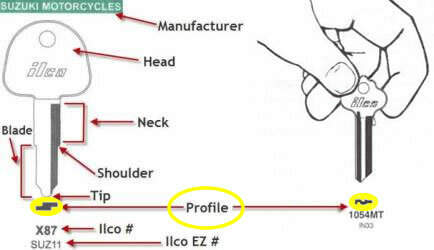 Place the tip of your key onto the profile, and look down ALL sides to check your keys profile with what is shown. If the profile shown matches your key EXACTLY, this is most likely to be the key you need. If it does not, find another blank that looks like yours and recheck profiles until you find one. Order keys when you feel confident to avoid return charges. Most Key Profiles Can be Found in the Six Categories Below. Click a Link Below to Begin. Find domestic and import keys for cars, trucks, tractor, equipment, golf cart, gas cap, boat, airplane, motorcycle, moped, ATV, quad, snow mobile, etc. Find most non vehicle keys for products found in the United States. Examples include keys for residential, commercial, padlock, cabinet, vending, RV equipment, poppers, lids, truck caps, Post Office boxes, mail boxes, etc. Find most non vehicle keys for products found outside the United States. Although most of these keys don't have profiles, they are unique in thickness, height, lengths and nose dimensions. DO NOT buy a key because it "looks" like yours. Please take the time to check the length, the thickness and nose dimensions before you buy.